Die Klimazwiebel: Climate change and extreme flooding linked by new evidence? Climate change and extreme flooding linked by new evidence? "It shows climate change is acting here and now to load the dice towards more extreme weather," said Myles Allen of Oxford University, who led the work, which he started after his own home was nearly flooded in 2000. It will also have wider consequences, say experts, by making lawsuits for compensation against energy companies more likely to succeed. Robert Watson the chief scientific adviser to the Department of the Environment and former chair of the Intergovernmental Panel on Climate Change said "This is ground-breaking work"
Until now, he said, scientists could state that global warming was expected to cause more extreme weather, but not that it was to blame for any specific event. "The research shows human-induced climate change is not an issue for the next decades or century: it is an issue facing us today." Myles Allen and his team compared the results of models simulating the real weather with models of the region's weather "as it might have been in a world without human-produced greenhouse gases." The models were run thousands of times to enable the probability of the extreme floods to be determined in both scenarios, taking 40,000 years of computing time. Global warming was found to have most likely doubled the risk of the 2000 floods, but there is a one in 10 chance that the increased risk was as high as 700% or as low as 20%. To illustrate his point, he pulled out the set of coloured dice. As time goes by and the greenhouse effect continues to increase, he explained, more sides of the die are coloured red as the probability of having a host summer increases. By 1995, he expected that the ‘man in the street ’ would recognize that the ‘die is loaded’. (Timothy O'Donnell, 'Of loaded dice and heated arguments: Putting the Hansen–Michaels global warming debate in context', Social Epistemology, 2000, vol. 14, 109–127). Hansen was ridiculed by Pat Michaels and others at the time. What will happen to Myles Allen? For some, this comes as no surprise. It is not the only current study about this topic. Here is another one by Seung-Ki Min, Xuebin Zhang, Francis W. Zwiers & Gabriele C. Hegerl, looking at the Northern Hemisphere from 1951 to 1999. To study how changes in climate influence the weather seems quite important to me. How could we possibly adapt to a changing climate if we do not know what to adapt to? As long as many parts of the world (esp. the biggest polluters) do not care about mitigation. More research on this topic is highly desirable. Concerning the topic I'd like to point over to <A HREF="http://climateprogress.org/2011/02/16/two-nature-paper-join-growing-body-of-evidence-that-human-emissions-fuel-extreme-weather-flooding-that-harm-humans-and-the-environment/>Climate Progress</A>, because there is a list of 14 papers concerned with the topic. I am sorry, I forgot a " at the end of the link. The well known problems - and uncertainties: the paper is based on questionable models. The abstract reads: "anthropogenic greenhouse gas emissions increased the risk of floods occurring in England and Wales in autumn 2000 by more than 20%, and in two out of three cases by more than 90%"
As a matter of fact the paper shows just a small rise on very low percents of the probable risks and may mislead readers: assuming a 90% increase of a 1% risk results in 1.9 rather than 90 percent. I doubt that the paper's findings will be supported by leading scientists in the field. "All the estimates presented in this analysis are inherently uncertain. Each facet of the integrated assessment model is uncertain. The emissions scenario, the climate scenario, the change in extreme events, and how damages might change are all uncertain"
The Guardian's biased reporting on climate issues is notorious. Contrary opinions, critical views? Non of this: the list of the commentators reads like a PR meeting of professional alarmists. 2) Perhaps you think that no scientists should even think about whether extreme events could be affected by climate change? I prefer that scientists feel free to study any questions they choose. 3) Perhaps you have another idea for how to perform detection and attribution that doesn't use models? I'm sure everyone in the field will be fascinated to hear it. 5) Climate change is here. As well you know. This kind of snarking from the sidelines is just low. If increasing temperature results in more extreme weather events, the development of extremes should be easy to retrace from the Little Ice Age onwards. I suppose there was nothing extreme during the LIA, except the freezing cold. So let's go back to these old and good times! you should re-read my post and think again if your comment is fair. I did not say that Michaels rightly ridiculed Hansen. This is your assumption. And how do you know that I know that climate change is here? Regarding 'snarking from the sidelines' you provide an (unintentional?) example of self-exemplification. A derivation of the word, "snark," or "snide remark." Snarking is the act of making rude or critical remarks or otherwise "pranking" another person, normally anonymously and online. Hmm, somehow my comments get swallowed as soon as there is some link in them. Just wanted to point over to Climateprogress.com (that's Joe Romm's "alarmist" blog), where he mentions another current study with about the influence of climate on weather and lists 14 other papers around the same topic. 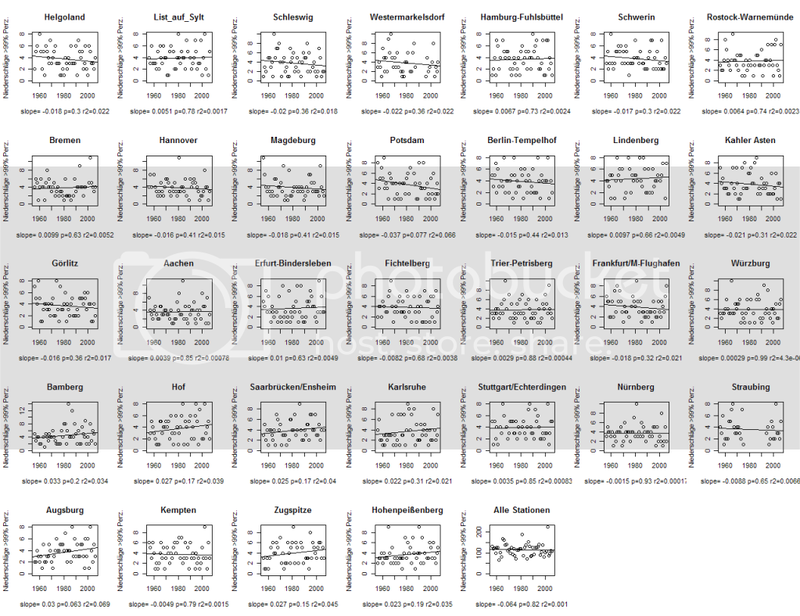 I took a look at daily free precipitation data from the Deutscher Wetterdienst (DWD). For every station I determined the 99% quantile value and counted the number of days/events in every year exceeding that limit. has a much more cautious comment. A vicious circle: bureaucrats expect scientists to provide the proofs they need for selling policies and calls for action. Some scientists are trying to fulfill these expectations, using models programmed to deliver the desired results. "an increase in extreme flood events due to an intensified hydrological cycle caused by global warming is simply not correct"
A commentator on a US TV business program this week described computer economic models as “fantasies.” Whenever “simulations” are mentioned, I think of the Holodeck on Star Trek. There was sometimes confusion between what was real and what was a simulation. James Michener wrote many novels which were fiction based on history. When one reads Michener’s books, one is often left with the question of what is historically accurate and what is fiction. There is a good blog by Andy Revkin, having contacted various experts in the field. What strikes me in the Guardian story I mention in this post is the attempted link to liability issues. As if two studies could lead to an avalanche of court cases against "major polluters". As the Guardian explains: "The work makes lawsuits against major polluters more likely, said barrister Richard Lord QC, an expert on climate litigation at Brick Court Chambers in London: "Showing that the chance of an event occurring has increased by say 100% or 200% gives you a much better chance of showing causation. It gets you around one of the legal obstacles." The question is only: aren't we all major polluters? This mode of thinking shows what is wrong with conceiving climate change in the pollution paradigm. It does not make sense to sue mankind... The above logic would make sense if the defendant had alternative courses of action, but causes knowingly harm by not using them. There's an interesting possibility how policymakers can prevent sues. Representative Joe Read (Rep/Montana) submitted Montana House Bill 549 entitled "An Act Stating Montana's Position on Global Warming." (3) (a) For the purposes of this section, "global warming" relates to an increase in the average temperature of the earth's surface. (b) It does not include a one-time, catastrophic release of carbon dioxide." I'm curious, if this nonsense passes Montana's parliament. If it does, it's an amazingly easy way to solve all problems connected with CO2 emissions. Q: "What are 1,000 lawyers on the bottom of the ocean?" Anyway, this sword cuts both ways. Holding people or companies accountable for their (economic) actions sounds like a good idea on first glance, but we are on shaky grounds once statistics gets involved. How about extending liabilty to weather bureaus for bad forecasting? Image owning a tourist outfit in England, and having relied on their "barbecue summer" forecast, and having invested accordingly? Sue them for lost revenue! Or how about taking climatologists to task for warming failing to materialize? I planted bananas in North Germany, and my crop failed, for Heavens sake! Sue! And while I am at it: I want Climate Justice all year round. Why the heck do I have to put up with cold and nasty weather from November til March, while aid-seeking Africans bask in the sun? Surely a case for the UN, isn´t? Looks like we are in for great times, while problems manifest today go unsolved. You have all done yourselves a dis-service by trying to discuss Climate Change in a scientific way. Climate Change is an un-falsefiable hypothesis and is therefore un-scientific. Any paper that even uses the term Climate Change should be considered pseudo science at best. If you talking about the Anthropogenic Global Warming Theory (AGW Theory) then say it. Don't make fools of yourselves by parroting the latest rubbish from the Ministry of Truth!!! @Reiner Grundmann: The reason pointing to ClimateProgress wasn't that I agree wholeheartedly to Joe Romm (who tends to support interpretations on the alarming side of interpretations) but just because I thought the papers mentioned in the post might be of interest to some readers. @Anonymous #18: Common courtesy suggests the use of names, even if they are just an online handle. Fred Moolten and Paul Dunmore are discussing the issue in Curry's blog. A brief lecture in applied logic, worth reading. Molten says that the proposition "anthropogenic greenhouse gas emissions are a major contributor to global warming" as a true/false hypothesis is wrong, because it is actually a measurement problem. With this note he identifies a major problem in the scientiftic discourse that has become a serious obstacle to communication. The debate could show the way to a middle ground accteptable for both parties, at least for the ones interested in continuing dialogue. I completely agree, I don't think it fits into the classic polluter paradigm at all. We would have lawyers suing power plants for emitting carbon while driving to court in carbon emitting cars. I think it requires more imaginative solutions. The reports about Min et al. (2011) are a bit contradictory. Are the results of Min et al. model-based or achieved by observations, i.e. "real data"? If they are based on observations, would you think, the results are reliable? Is it the proof (within 90%-probabiity of course), that precipitation is indeed rising? Thanks in advance. I would read for myself, but 32$ is a little expensive. Some background on the Min et al. paper. the paper is what is usually called a detection and attribution study. The goal is to detect the fingerprints of the effect of external forcings in the observed data. External forcings may be GHG, solar irradiance, aerosols, etc. A. Calculate the fingerprint of a external forcing. You achieve this by performing two simulations with a climate models, one control simulation with present conditions and one simulations with, for instance, increased GHG concentrations. The difference between both is the fingerprint. Caveat here is that there are random variations in this difference, and so several models and several simulations with different initial conditions are used to reduce those random variations and get a more streamlined fingerprint. The fingerprint is then the difference of the paired simulations (control-perturbed) averaged across all models. C. Go to the observations and see how strongly this fingerprint is expressed, and whether or not the trend in the strength of expression increases with time. D. Go to control simulations for present conditions but with no change in the forcing (e.g. assuming constant GHG concentrations) . estimate how the fingerprint expression varies randomly and estimate the amplitude of this random variations. E. If the trend in C is larger than the amplitude of the variations in D, the fingerprint is said to have been 'detected'. If it is detected in only the simulations with anthropogenic forcing but not in those with only natural forgings, the pattern is said to be attributed to anthropogenic forcing. There are some technical subtleties to account for uncertainties in the fingerprint and other things, but basically this is the method. You could think of a table in which many people place their hands and so the fingerprints of all of them are blurred. You know the fingerprints of a particular person. You try to discern that pattern in the sea of all other fingerprints, and you do it as years passed. If you can see that pattern emerging above some level of noise, you detect the more frequent presence of that person. The noise level is calculated by looking for that pattern on a table which you know has not been visited by that person. I would rather agree with Dunmoore on this. Also, I have problems trying to understand Molten's initial statement. I think he is confounding two different approaches to probability. His first assertion (A) only makes sense within a Bayesian approach, and not in a general setting. The concept 'The probability that anthropogenic causality is true' is not well posed. this probability is of course 1. My body temperature is 37 C, and therefore I warm the atmosphere more than if I did not exist. Even if we restrict ourselves to the effect of anthropogenic carbon emissions, this proposition is meaningless as well: either humans affect climate or not, so the probability is 1 or 0. What Molten is referring to is not to probability but rather to a degree of believe, defined with a Bayesian framework. On the other hand, statement B is a classical test of hypothesis within the classical statistical theory. I think this is the source of his confusion. Other than that, I do think that it is a problem of quantity (measuring problem) and not of quality (yes o no). We have discussed it often here that the relevant question is 'how much'. Implicitly, the question ' are humans affecting climate' actually should be formulated as ' is the effect of humans on climate larger than natural variations ?' The answer to this question can only be of statistical nature, because one cannot rule out that natural variations, just by chance, may happen to be very large at a particular moment ( for instance, an expected very large volcanic eruptions). or small, e.g. in period when the sun is very constant and no volcanic eruptions occur. We also see here, and in the study by Min et al., the dichotomy involved in post-normal science. On the one hand, we are correctly told that the expected signal of GHG is detected in the observations of intense rainfall and so a policy maker would conclude that action to reduce emissions is required. On the other hand, we are also told that models underestimate the observed trends, and so models are wrong. A pure scientist would conclude: we need better models before we can say anything. I agree with you in the first point. Regarding the sentence "The probability that anthropogenic causality is true" - the probability is 1. We could add "...are THE major contributor ..."
There is a problem of quality (measuring problem), not only with land surface stations and the whole station network- but with definitions as well: what exactly do we understand with "global temperature?" for instance. Anyway and even if there are still a lot of mistakes made, the interesting point is the attempt to get over black and white thinking: AGW (in the sense of "anthropogenic greenhouse gas emissions are the major contributor to global warming"): yes/no. Discussions like the one linked above and - hopefully - the one here on this blog, show some remarkable progress in communication and understanding. Maybe this will be much more useful than models and bigger computers. Myles Allen said: "It shows (anthropogenic, W.K.) climate change is acting here and now to load the dice towards more extreme weather". "There is no theory or result that indicates that climate change increases extremes in general"
@Eduardo 23: Thank you for this insightful post. I appreciate your contributions at Klimazwiebel very much, for example your article about MacShane/wyner was excellent! "On the one hand, we are correctly told that the expected signal of GHG is detected in the observations of intense rainfall and so a policy maker would conclude that action to reduce emissions is required. On the other hand, we are also told that models underestimate the observed trends, and so models are wrong. A pure scientist would conclude: we need better models before we can say anything. " But models never will be "right" even if you have a more practical definition what right and false means in this context. Also a pure scientist does not need never existing perfect models. If models over/underestimate decadal rainfall trends but allways react with an intensification of the Hadley Cell then he/she can say something to policymakers. It is at the heart of the scientific endeavour to see the open questions (that is finally what gets us paid at the end of the month) but that does not mean that many things can be said with reasonable certainty. Georg: "If models over/underestimate decadal rainfall trends but allways react with an intensification of the Hadley Cell then he/she can say something to policymakers.". - What would he/she say to policymakers - that all contemporary models show an intensification of the Hadley Cell? Sure. But the key part with "detection and attribution" is a statement about the real world - by comparing observed (to the extent possible) recent past and the modeled foreseeable future. If these two do not fit (given the uncertainty), we have a problem with our knowledge. The statement "all models are false" is correct if you speak about "models of climate", but if you speak about "models for the description of large-scale climate dynamics and its dependence on CO2 concentrations" it is not. And for climate models to be used as practical tools, they should be the latter. "Some extremes will become more common in future (and some less so)." It is telling that you need support from Nietzsche to keep your own concerns under control. I think this is indeed necessary; natural science is here far from convincing (on both sides, by the way). "Some extremes will become more common in future (and some less so)." - this statement is surely entirely correct, almost trivial. More heat waves, fewer cold spells; more intense rainfall events in many areas, less polar lows in the Northern North Atlantic. Sure, and that's because of the emission of greenhouse gases, right? That's what your model FOR dynamics etc say, right? So Georg is right when he says that there is enough evidence to talk to the politicians. Sure, Werner, the statement "some extremes will getting stronger, some weaker" is hardly contested, - but possibly not very practial. When we refer to rainfall, and the plausibility that extreme events would become more severe, I would always request evidence that such a tendency is discernible in the regional data (based on many decades of data). I understand that such a "signal" is not yet detectable in present extreme rainfall data in Germany, but there may be more recent results of which I am not aware. "I understand that such a "signal" is not yet detectable in present extreme rainfall data in Germany, "
Wundert mich fast, dass man da mit echten statistischen Mitteln (und nicht meinen eher bescheidenen), nicht rauskitzeln kann. Georg, das Problem ist die Homogenität der Daten. Was bei Niederschlag mit allem möglichen einhergeht, veränderliche Bebauung, Vegetation - auch in größerer Entfernung - neue Geräte. Daten zwischen 1940 und 1950 - wie wurden die erhoben? Wie gesagt, ich erinnere Vorträge von DWD Leuten, die sich die Daten genau angesehen haben, die nach entsprechender Homogenisierung nichts mehr davon sahen. Waren die Daten, die Du betrachtetest homogenisiert? Ich habe nur ein wenig rumgespielt. Es sind die auf dem Web freiverfuegbaren DWD Stationen (damals 44 mittlerweil anscheinend 46). Da steht im Header was von geprueft etc, aber wahrscheinlich nicht homogenisiert. Es ist ja recht offensichtlich, dass vor 1945 irgendwie anders gemessen wurde (war ja schliesslich mit der Perspektive einer 1000 jaehrigen Datenreihe!). Wenn also das, was du sagst, tatsaechlich das "Signal" kaputtmacht, ist es ja auch irgendwie interessant. Wie erzeugt denn Verstaedterung einen Hang zu Starkniederschlaegen? Sommerliche Waermeinseln mit starken Gewittern? Nein, die Inhomogenitäten können in beide Richtungen gehen, sofern ich weiss. Allerdings könnten genauere Geräte eine Tendenz zu größeren Extremen haben: höhere Genauigkeit. Werde bei Gelegenheit meine DWD-Kontakte fragen. Aber wenn Du einfach Daten aus dem Netz zusammenklaubst, ohen kritischen Vorbehalt, benimmst Du Dich wie Michael Chrichton, der suchte sich auch inhomogene Daten auf dem web zusammen. Nur der Neugierde halber: würde mich mal interessieren, weshalb die Herren für "gute deutsche Wertarbeit" - s. Links N° 11 - wenig übrig zu haben scheinen? "benimmst Du Dich wie Michael Chrichton, der suchte sich auch inhomogene Daten auf dem web zusammen." Und der verdiente Millionen damit! "Diese Daten sind weitgehend geprüft. Ausgenommen sind aktuelle Daten, die noch nicht vollständig die routinemäßige Qualitätskontrolle durchlaufen haben und Daten einiger automatischer Stationen, die keine Augenbeobachtungen melden. Weiterführende Informationen zur Qualität der Daten (Qualitätsbytes) und zu den Standardformaten wie z.B. die Formatbeschreibungen finden Sie auf der Seite Beschreibung der Standardformate." nicht unbedingt der letzte zusammengewuerfelte Kaese. Und ausserdem ist so ein Blog-Eintrag ja nun wahrlich nicht eine Art letztes Wort. Vor einen Senatsausschuss wie Crichton haette ich mich damit sicher nicht getraut. the issue is not void of subtleties, Indeed the pattern of increases in extreme rainfall is 'detected and attributed' by the models in the sense that only models driven by anthropogenic forgings produce a pattern 'similar enough' to the observed. However, one has to keep in mind important points: one is what I pointed out in my previous comments: all models analyzed underestimate the average increase in extreme rainfall; second, although the simulated pattern is similar, it is not identical, and there are areas, - even large areas- where the sign of those patterns is opposite. For instance, observations indicate an increase of extreme rainfall in the Southeast US, whereas models predict a decrease. The same can be said in large areas of Central Asia and North India. What would you say to a politician in California or India? Globally the modelled pattern is similar to observations, but in your country the models got it completely wrong. What do you think he/she would say to that ? I just read the initial paragraphs of the wattsupwiththat blog, but they are enough to understand that the author of those paragraphs has not a very solid command of statistics – not that I have it either, but at least I am aware of what I still do not know. Wattsuptwith looks at individual stations record and says that only a few display a statistically significant trend, only 11% apparently. He goes on to say that since 91% percent of the stations are 'doing absolutely nothing' there is nothing to see here. Well, just a short example suffices to illustrate this fallacy: I can calculate the trends of 100 records, each one 50 years long. I estimate the linear trend of each of those records, and none of them turns out to be statistically significant (to keep things simple, let us assume the usual null hypothesis and conditions, everything is normally distributed and all records are independent, etc). So, nothing to be seen here? No, if I also find that that all trends happen to be positive, for instance. Each trend is not statistical significant on its own, but taken together the whole set of trends is highly statistically significant . That would be a simple example of pattern detection, which is what the Min et al. paper is about. I agree with some aspects of your objections - but I doubt this would be enough to brush off Eschenbach's critique as a whole. Did you read J. Curry's, R. Pielke's and A. Revkins comments as well? "What would you say to a politician in California or India? " Well that's not actually part of my obligations. But my conclusion from that is that both politicians should find democratic majorities in order to avoid a situation where climate will tell us which one of the two model predictions comes true. As larger the uncertainties and as greater the divergence between model predictions as more would I conclude that adaptation might systematically come too short/too late and mitigation is a safer strategy. But this is a political statement, not much to do with Science. However I'll tell you even what will happen in any case (independent of my wise recommendations). Politicians will speculate that their nation will be part of the relatively small group of winners in the climate game and avoid any cost intensive strategies, both no money for adaptation ,no money for mitigation. the anthropologist is confused: is this about politics or about science? Looks like an uncontrolled back and forth or switching from one field to another. Is it possible that those models are political themselves, deep inside? if one entitles his weblog as a 'flood of bad science' , and starts off with a serious misunderstanding, which is highlighted several times in the text, you would agree that I am not very inclined to give much credibility to the text as a whole. Actually, that webpost is as drastic and lacking nuance as most press-releases that I have happened to read about the Min et al study. Roger Pielke explained that there are no detectable trends of normalized climate-disaster economic losses, which I have no reason to doubt- actually I believe that this is true as well. I do not see a contradiction with Min et al. We should not forget that Min et al. 's claim is that they were able to detect a certain signal in the observed noisy record of extreme rainfall. As far as I understand, they did not claim that trends in extreme rainfall are only caused by GHG or even that GHG are the most important cause for trends in extreme rainfall. The implicit conclusion is indeed that, given that the signal is there, and given that GHG concentrations will continue growing and other forcings will not, GHG will at some point become the dominant cause in the future. It may be that of the some fuss about this study is confusion about these subtle differences . Revkin warns that there are uncertainties in this study – as in many others. I would also agree. Eschenbach might be an academic lightweight in your eyes (talking about his style would be another issue) and there are some misunderstandings in his comments indeed. So if you don't wish to give it much credibility, why do you preeminently focus on that post? You could answer him directly on WUWT. I didn't mention WE as a "crown witness" to show that the Min et al. paper is not correct - but he is asking some justified questions. From my part there are no judgements besides the ones in post N° 4. Pielke Jr. doesn't just talk about "climate-disaster economic losses" as you try to make us believe. He writes: "A recent study of trends in long time series of annual maximum river flows at 195 gauging stations worldwide suggests that the majority of these flow records (70%) do not exhibit any statistically significant trends. Trends in the remaining records are almost evenly split between having a positive and a negative direction"
"I expect that many will still want to connect the dots between greenhouse gas emissions and recent floods. Connecting the dots is fun, but it is not science." "Not sure what the motive is for the attribution of extreme events, other than to build political will for climate change policies"
Revkins comment is an interesting piece of scientific reporting under post normal conditions. Interesting because Revkin seems to be more cautious and reserved than he used to be about a year ago. While the quality of Gavin Schmidt's prediction "some extremes will become more common in future and some less so)" finally opens the door to climate astrology. I still recommend the two links listed in N° 11. See the inline links as well. the problem I see is not to be a lightweight. Everyone should be able to comment on published work. The problem I do see is that he comments with a style that appears aggressive, dismissive, when at the same time the contest of his post are quite questionable. In @4 you wrote that the results of those studies are uncertain. Sure, the Min et al. Study for example, is based on the assumption that control simulations the ones where the external forcing is kept constant) can reproduce the right amplitude of internal climate variations) This is very difficult to prove, since those internal variations cannot be observed directly (the real climate is always forced). This happens in virtually any scientific study. There are always some underlying assumptions. But this is not reason to qualify a paper as a flood of bad science. Floods and extreme rainfall. They are not the same thing, as Roger Pielke also underlines. And again, the Min et al study detects the GHG signal in extreme precipitation. It does not say that GHG dominates the variability or the trends of extreme precipitation. These are tow different things and it may well be that the press releases or further comments failed to split that suble difference. How would I go about to find empirical evidence for the ~6.5%/K extreme precipitation increase (CC equation) in german weather service's daily data? Don't let us waste more time on lamenting over bad manners. At least you can see Eschenbach being confronted with a lot of critical questions. WUWT is not just a meeting place for brainless headbangers and "claqueurs". Talking about severe river runoffs in England and Wales, flood water has to come somewhere from. Precipitation without floods, ok - but floods without precipitation? Pielke Jr.: "Precipitation is to flood damage as wind is to windstorm damage"
If - as you say - GHG signals do not dominate the variability or the trends of extreme precipitation - what are we exactely talking about - and telling the politicians? It's all about uncertainties - and open minded research and debates. I don't think that's where it exactely started with the rather biased Guardian report and its odd testimonials. let us try to mix things up. You pointed us to Eschebach post – I had not read it before. So I read it and saw that it was technically not correct. You seemed to agree, but you again suggested that that post may contain other aspects that cannot be dismissed. Which ones exactly ? I am happy to read the technical details more closely and perhaps learn a bit doing that. well, that is exactly the point. You may have trends in precipitation and/or extreme precipitation and not to have them in floods or flood-related damage, which is what seems to be observed. I said that the Min et al paper does not claim that GHG dominate the trends in extreme precipitation. I do not know whether or not that is true, but the paper does not claim it, as far as I understand it. What do we say to politicians? Thats the dilemma we were discussing before. Let me illustrate it with a further example. Let us assume for the moment that we know that the observed trend in global mean surface temperatures is mainly caused by trends in solar irradiance. However, we also observe that the trend in stratospheric temperature is negative, and no other forcing than GHG can produce this negative trend. This is similar to pattern detection. We would have detected a signal of GHG, although the effect of GHG may be not dominant in the observations of surface temperature in our example. What we say the politicians is a matter of taste.I would go for telling them everything. The Pall et al. paper on England and Wales floods is technically of a different sort, and is almost exclusively based on model results and basically only on one model . I think that therefore the uncertainties in this paper are larger. To be honest I havent read the Guardian report. Probably it is biased, I would not be surprised. But then why dont you discuss that report instead of the watssupwiththat weblog ? "other aspects that cannot be dismissed"
Why don't you - just ignoring the title - follow Eschenbach's thread - and the discussion where he answers different questions, like the one linked by wflamme (N° 51)? Among other difficulties first and above all we would have to accept the attribution of the last 150 years warming to GHG effects as accurate. Besides that there is the fact that models are not good at simulating historic rainfall at regional scales. There are the uncertainties in the (raw) data (HADEX RX1day dataset), the quality/homogeneity of the used data, the use of averaged data with questionable models, the choosen time-frame, increasing negative aerosol forcings - and regarding the Min et al. paper - atmosphere/ocean feedbacks, the increase in land use with more impervious surfaces leading to a higher flood potential etc. - just to mention some of the problems. By the way: the floods in England and Wales (20009 were not record-breaking in a historical context. Uncertainty: are we really able to attribute extreme (regional) events with high certainty to anthropogenic GHG emissions - and to exclude natural factors the same time? There are/were quite a lot of similar papers in these last years claiming that GHG emissions would lead to an increased number of droughts. A change in conjuncture cycles or in "marketing strategies"? Looking at historical floods and other extreme weather events, one can hardly pretend we would see more an more severe ones of them in present times. OK, the authors talk about identifying "signals". Signals that obviously show such weak correlations that they are difficult to detect in the statistical noise. Coupling weather events with an non-linear, chaotic system remains a difficult task ... Do standard statistical techniques give useful results when they are applied to these type of events? When I read sentences like "approximately two-thirds” or "limited availability of daily observations” it all ends up in pure speculation. no, sorry. I have quickly gone through the comments posted in Judith Curry's blog,a nd it seesm to me that most of the m are not related to those papers specifically. Some are even discussing carbon tax. This is what I want to avoid. A mass discussion like that very often goes astray and in the end nothing really clear comes out - at least in my experience. there seems to be lost of confusion about those papers, and maybe the reason is that being both behind a pay wall, few of the commenters seem to have read them in the first place ! here I would say Nature should be more open with certain papers that are promoted by Nature itself - they should be open access. the Arctic Oscillation, La Nina, etc in producing floods.' This is not correct. Both studies do take into account natural variability- this should be very clear for any expert who has read the papers. It can be argued that they do so assuming that the natural variability simulated by models is close enough to reality, and this may be questionable. But to say that they do not take that into account is simply, and surprisingly, wrong. This one I would buy. It is indeed difficult for models to simulate precipitation properly, even more extreme precipitation, and even more focusing at a certain region like England and Wales, with complex coast lines. questionable models' Here I dont see the problem. Why should averaging be problematic ? atmosphere/ocean feedbacks'. No , you are not correct here. It is the Pall paper that assumes that feedbacks are not important. The Min et al paper considers full feedbacks: it uses the IPCC simulations with atmosphere-ocean couple models. Also, the Min et al. paper does not deal with floods but with extreme precipitation. natural factors the same time? No, none of this papers does that. The Pall et al paper claims that GHG inceases the odds of having England-2000 style floods, not that those particular floods were caused by GHG - somethuing impossible to attribute of course. The Min et al paper does not attribute any event in particular to GHG, but , repeat, identifies the expected (from modelling) pattern of extreme precipitation change in the observations. The Min et al paper does not claim that GHG leads to more or less extreme precipitation globally. It just identifies a pattern of increasing in some place and decreasing in other places. Yes, thy are difficult to detect, but the Min et al. paper does just that. Eschenbach makes two errors: he confuses statistical significance with signal strength, and he does not take into account field significance versus individual significance. To the first point: a signal (correlation, difference in means, etc) can be strong and yet not statistical significance, due to the lack of data, e.g. the series are too short. on the other hand, a signal may be very weak (correlations as low as 0.05) may be statistical significant if I have a lot of data (say a time series with several millions of data. So when he says, the trends are not statistically significant and there fore there is no signal, he makes a mistake. It just may be, although not necessarily, that the data are not enough. This is why one may look at many records and search for a certain, theoretically prescribed pattern. For instance I may have 100 independent short records of whatever variable. All display a positive trend, but due to the length of each record, none of the trends is statistically significant. It does not mean that the signal is not there, it just means that the series are too short. But when I realize that all series display a positive trend , the odds that this happens by chance are very very very small, and therefore the overall pattern of trends is highly statistically significant. I have the impression that Eschenbach has not grasped this if I understand his responses well. "most of them (posts on JC's blog) are not related to those papers specifically"
OK, like in all open blogs it is a mass discussion but the main issue concerns "Attribution of Extreme Events". You might ignore a good part of the posts and taking in account at least some of the others. "Both studies do take into account natural variability"
Not my words. I talked about "atmosphere/ocean feedbacks"
"There is no need for a accurate attribution of GHG warming. Actually, none of the studies uses temperature data"
"Here we show that human-induced increases in greenhouse gases have contributed to the observed intensification of heavy precipitation events"
Of course the authors or their models suppose that more CO2 will lead to higher temperatures which lead to an increased water evaporation, thus to more precipitation. Blog entry, see above: "a global average temperature increase will cause a global average increase in the amount of water vapour, which will cause an increase in average precipitation globally"
"Global warming was found to have most likely doubled the risk of the 2000 floods"
"models seem to underestimate the observed increase in heavy precipitation with warming"
"Why should averaging be problematic?" Instead of opening a new thread, let me cite Michael Blastland: "the world is a soup of sometimes wildly varying ingredients. The average is like the taste and tells us how the ingredients combine. That is important, but never forget that some ingredients have more flavour than others and that these may disguise what else went into the pot." "The model runs incorporate those (aerosols) forcings"
I'm not convinced they do it appropriately. But this , of course, is a weak objection due to the fact that we have no detailed view on these models. "It is the Pall paper that assumes that feedbacks are not important"
"The Pall et al paper claims that GHG inceases the odds of having England-2000 style floods, not that those particular floods were caused by GHG - something impossible to attribute of course"
Pall et al. : "it is very likely that global anthropogenic greenhouse gas emissions substantially increased the risk of flood occurrence in England and Wales in autumn 2000"
A communication problem? Wrong message? Please read the blog entry and the Guardian article: "Global warming made the floods that devastated England and Wales in the autumn of 2000"
"The Min et al paper does not claim that GHG leads to more or less extreme precipitation globally. It just identifies a pattern of increasing in some place and decreasing in other places"
Professor Rowan Sutton: "The increase in extreme precipitation has a firm foundation in basic physics, the scientists said, as a warmer atmosphere can hold more water"
"I am not sure I understand what you mean here"
The attribution of specific events to GHG emissions. Eduardo: "something impossible to attribute of course"
While we appreciate the opportunity to discuss our work, we found that the resulting opinion piece "The Weather Isn't Getting Weirder" (Feb. 10) does not accurately reflect our views. As for the statement that the Twentieth Century Reanalysis Project, which is a synthesis of weather observations going back to 1871, shows "little evidence of an intensifying weather trend": We did not look at weather specifically, but we did analyze three weather and climate-related patterns that drive weather, including the North Atlantic Oscillation. And while it is true that we did not see trends in the strength of these three patterns, severe weather is driven by many other factors. The lack of a trend in these patterns cannot be used to state that our work shows no trend in weather. Many researchers have found evidence of trends in storminess and extreme temperature and precipitation in other weather data over shorter periods. Finally, the article notes that the findings are "contrary to what models predict." But models project forward, while our analysis looked back at historical observations. We see no conflict between the 100-year-projection of changes in weather extremes resulting from additional carbon dioxide and the fact that our look back at three indicators showed no historical trend. This is what Judith Curry wrote. You pointed to that blog. Please, pay attention to the meaning of all words. The last sentence makes the connection between GHG and extreme precipitation. The first sentence involves GHG *warming*. I repeat that the study by Min et al. does not requite that the models *accurately* simulate GHG warming. They could underestimate it, and yet the pattern of extreme precipitation trends could be detected. I have to explain again, those studies are based on detection of spatial patterns of trends (here rising, there decreasing), and not whether or not the *magnitude* of the trends is correctly simulated. Not correct. The pattern of trends in extreme precipitation has positive and negative values. therefore in some areas the models (at least the mean across all models) predict an increase in extremes and in others a decrease in extremes when driven by increasing GHG. more flavour than others and that these may disguise what else went into the pot." Nice sentence, but what the Min e al study did was to average over several gridcells to match the resolution of model and observed grids. To me it seems a reasonable thing to do. They are not averaging 'different ingredients'. “"The model runs incorporate those (aerosols) forcings"
I'm not convinced they do it appropriately. But this , of course, is a weak objection due to the fact that we have no detailed viewon these models. The original claim ( I dont know now by whom) was these studies dont incorporate the effect of aerosols forcings. The answer is that they do. If the original claims had been that it is doubtful that the effects of aerosols is incorporated realistically, it could be argued. I have the impression that we are moving goals here. “Pall et al. : "it is very likely that global anthropogenic greenhouse gas emissions substantially increased the risk of flood occurrence in England and Wales in autumn 2000"
That is exactly what I wrote. The paper Pall et al. claims that GHG increased those odds. It does not say that GHG *caused* the floods. This latter type of attribution is impossible. “Professor Rowan Sutton: "The increase in extreme precipitation has a firm foundation in basic physics, the scientists said, as a warmer atmosphere can hold more water"
Professor Sutton, or whoever quoted him here, is wrong. A simple counter example is that in Spain rain comes in winter not in summer. And extreme precipitation in Spain occurs in autumn, not in summer. So there must be something else. See also my comment above. Models predict a *decrease* of extreme precipitation in some areas when driven by GHG. it is more complex that at first sight, depending on your background. You can have an impression here , although the calculation you did may be a good starting point. You could count the number of positive and negative trends, and establish its statistical significance by generating artificial surrogate station data when the trend has been destroyed: reshuffling in time all data. Do this 1000 times, repeat the calculation of the trends and count how many are positive. If the number of positive trends in the original data set is larger than the 95% quantile in your 1000 realizations, then you may have detected something. precipitation will not increase according to CC, but less, in the range of 1-2 %/K, see here This is because there are also dynamical and energetic constraints to the increase of precipitation. I am not sure now (I am on holiday :-) whether this is true for extreme precipitation as well. It is in general not valid anyway, since models predict a decrease of extreme precipitation for some areas, since they predict a global increase of precipitation but a decrease in the subtropics. So the story is much more complex when one goes from the global mean to finer spatial scales, quantiles and seasons. I was aware of this kind of "argument" with your first attempt on N° 57 ("maybe the reason is that being both behind a pay wall") - and then decided just to ignore it. Honestly - and for all those who don't have the opportunity to read the full text, are you trying to tell us that the abstracts of the two papers discussed here are quite misleading? "Please, pay attention to the meaning of all words"
"the models predict an increase in extremes and in others a decrease in extremes when driven by increasing GHG"
"The paper Pall et al. claims that GHG increased those odds. It does not say that GHG *caused* the floods"
Rhetorics, sorry - just notice how the issue is interpreted not only by the Guardian but by the authors themselves and the cited supporters, by the public in general. A communication problem as Gabriele Hegerl says? "Prof. Sutton, or whoever quoted him here, is wrong"
Sutton is one of the supporters mentioned above. "in Spain rain comes in winter not in summer. And extreme precipitation in Spain occurs in autumn, not in summer. So there must be something else"
How about high (summer) and low pressure (autumn) phases, wind transporting moist air from the atlantic and the mediterranean ocean? "The warm, humid winds blow in from the Atlantic and cool and condense as they pass over these limestone peaks"
Ralph picked the cherry from that link: "one of the wettest villages in Spain is not on the Atlantic coast but in Andalucia. Grazalema in the Sierra de Grazalema has an average of 2,153 mm of rain a year. The warm, humid winds blow in from the Atlantic and cool and condense as they pass over these limestone peaks. The wettest points are certainly on the Galician -Portuguese border and parts of Northern Navarra." That's a mountain effect, not a seasonal pattern. typical pattern of winter, not summer, rainfall. We all like cherries, don't we? The patterns are first shown in upcoming humid winds in autumn and wintertime. There would be no mountain effects otherwise. eduardo: "Eschenbach makes two errors: he confuses statistical significance with signal strength, and he does not take into account field significance versus individual significance." Thank you for your response and your spare time sacrifices. Willis: "I put all of those trend numbers in because they are important as an indication of the size of the change that we are looking at. It is a very tiny change if it exists at all. We know that because of the amount of the underlying data which contains no trend at all. This is a different result from e.g. finding a tiny trend that results from the averaging of a large number of significant trends." With respect to the effect strength estimate this certainly is true. However accompanying statistical diagnosis would reveal the difference. Willis: "In addition, it indicates that the size of their claimed effect is doubtful. They claim that the number of extreme events in much of the US has increased by 30-50% over the last 50 years … are you seriously claiming that if that happened a simple trend test would not be able to detect a 30-50% change, and that such a 30-50% change would be statistically insignificant in over 90% of the stations?" If Min makes that claim in the paper Willis' for sure has a strong point here: Any effect on extremes that general and strong should easily be detectable and should stand well out above gridcell noise. In addition I'm suspicious as well about that PDF fitting. After all that procedure can't produce any new information but only reflect what has been observed already. With respect to DWD data and increase in Germany's extreme precipitation I was looking for a reference procedure not giving percent change over time but percent change over temperature change. That's because I'd like to avoid potential fallacies arising from any indirect two step conclusion. I also don't want to 'waste' that precious dataset by endless multiple testing of ideas (it probably has been to much already). "Mr. Flamme, when did you stop torturing your data?" Actually I couldn't. But did they confess? Now that's just what I did - comparing every pair of observation in the station's extremes set with every other pair, seperately noting numerator and denominator. Finally I used OLS to estimate the average dP/dT between them. To speed things up a little I used the top 30 extremes or .99 quantile, whatever set was smaller (resulting in ~400 pairwise comparisons for every station). I dont see why one should expect the CC relationship to be fulfilled for extreme precipitation at regional scale. I would perhaps expect a relationship between mean precipitation in Germany and average temperature over the ocean areas that are the main source of precipitable water for Germany, which probably is the whole North Atlantic. At regional scale, and depending on the season when extreme precipitation occurs, I would even expect a negative relationship: if extreme precipitation occurs in summer, more cloudy summers over land will be associated to colder summers over land. We should not forget that precipitation is not solely modulated by the available water vapor, and that atmospheric dynamics plays an important role. In climate simulations precipitation is predicted to increase in some regions and decrease in others, and even in a given region to increase in some seasons and decrease in other seasons. these are reasonable objections IMO. However I didn't expect it - I was just checking the more general lines of reasoning using a readily availabe sample. After all many scientific media and most of its most popular outlets say that increases are happening already. I don't need to provide examples, do I? Regarding the models: Extreme precipitation is rare by definition and variable by nature. I'm not sure wether the model's results are substantially different from what we could expect when comparing two random samples of observations from an 'undisturbed' climate. sure, unfortunately many journalistic reports and press releases have to be taken with a grain or two of salt. An intelligent observed would try to look under the carpet and figure out which part is likely true and which part not so likely. In theory, this would be the task of scientist themselves, but unfortunately this seems to be difficult nowadays. Concerning your second comment (an undisturbed observed climate..), this is the nub of all our pains. We cannot observed a climate that is for sure undisturbed. This is the reason why attribution can only be achieved with models, in which undisturbed and disturbed climates can be recreated. This is essentially the method applied by Min et al.